We've whipped up a cake SO chocolatey and decadent, your head may ACTUALLY explode. (Consider yourself warned -- we're not going to be responsible for sweeping up the mess.) You'll need four baking ramekins (about 4 inches in diameter) for this recipe -- pick some up at a store like Target. Enjoy! Place chocolate chips for the cake in a tall glass along with the contents of the cocoa packet. Add 1/4 cup boiling water and stir until chips and cocoa have dissolved. Add 1/2 cup cold water and stir well. Pour the contents of the glass into a mixing bowl. Add all of the remaining ingredients for the cake (cake mix, egg substitute, Splenda, and salt) to the mixing bowl, and whip batter with a whisk or fork for 2 minutes. Once the chocolate mounds in the freezer are a little firm, spray four baking ramekins (each about 4 inches in diameter) with nonstick spray. Evenly spoon the cake batter (which will be a little thin, but don't worry!) into the ramekins. 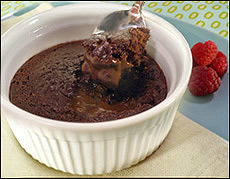 Remove chocolate mounds from the freezer, and place one in the center of each batter-filled ramekin. Put the ramekins in the oven and bake for 15 minutes. Cakes will look shiny when done. 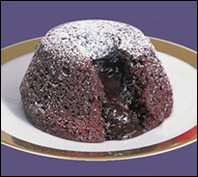 Chocolate lava cake is one of those desserts that's sometimes a little TOO hard to pass up. Rich, fluffy cake is tempting enough on its own, but when it has gooey, melty, chocolate ooze in the middle?! Well that's enough to push it over the edge and make it nearly impossible to turn down. Be strong, lava-lovers! On average, that single-serving sweet 'n fatty mess will set you back about 437 calories and 23g fat. As for the infamous ice-cream-topped Molten one at Chili's? 1,290 calories and 62g fat. AHHHHH! So unless you're sharing it with a few friends (and there's never enough chocolate goo to go around! ), you're better off passing on this dessert. Luckily, you don't have to forego molten-centered chocolate cakes for good. We've come up with a version we're pretty sure you'll FLIP over. Make a few cakes before you go out, skip dessert at the restaurant, invite your pals over, and pop 'em in the microwave when you get home (the cakes, not your pals). We're full of good ideas. And soon YOU'LL be full of chocolate. Weeeee! February is Celebration of Chocolate Month so, um, we'll be celebrating! Party down with a batch of our Best of My Lava Chocolate Cakes, and you'll understand why chocolate gets a whole month of praise. Share this email with chocolate-loving humans everywhere. Click "send to a friend" NOW!